An article published in the journal “The Astophysical Journal Letters” reports the study of stars surrounded by iron dust in the Large Magellanic Cloud, one of the Milky Way’s satellite dwarf galaxies. 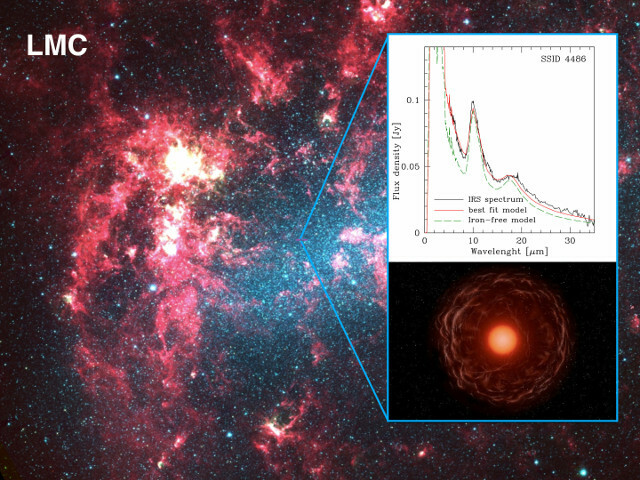 A team of researchers led by Ester Marini, a doctoral student of the “Roma Tre” University, Rome, Italy, used data collected by NASA’s Spitzer Space Telescope to examine these stars that are in a phase of their life in which they lose their outer layers. Normally, that type of stars is surrounded by silicates and the anomaly is interesting because the dusts are important in the formation of new stars and planets as well.